Bulgaria's ski holiday resort Bansko has been named Europe's best value ski resort by TripAdvisor for the second year in a row. The resort was found to offer the best value when compared with 40 other ski destinations, based on typical one-day-visit ski costs plus food and drink. The costs amounted to just GBP 104 at Bansko. A similar day on the slopes at Courchevel in France - the most-expensive destination - was as much as GBP 432. Other bargain resorts included Sochi in Russia (where the one-day costs were GBP 137), Ordino Arcalis in Andorra (GBP 138) and Arinsal in Andorra (GBP 141). 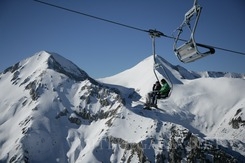 In contrast costs were as high as GBP 428 in St Moritz in Switzerland and GBP 404 in Meribel in France. The ninth least-expensive resort was the Cairngorms in Scotland where a one-day trip would set visitors back GBP 173. TripAdvisor spokesman James Kay said: "Eastern European destinations and Andorra offer the best value and, for those wanting to stay closer to home, it's great to see a Scottish ski resort among the 10 least-expensive destinations."